Facility optimization software: the future of facility management? Facility optimization software: the future of facility management beyond the silos? As mentioned on our facility management overview page the silos in facility management and facility optimization increasingly get removed in a perfect storm of changing priorities, the integration of IT and OT, the increasing ubiquity of data turned into insights and (increasingly autonomous) smart decision capabilities, leveraging advanced analytics, artificial intelligence and, how else could it be, the IoT (Internet of Things). Obviously it is not all happening at once. However, it’s clear that demand for predictive analytics and asset optimization (including predictive maintenance), better interoperability, energy efficiency, enhanced value and simply the applications powered by all these and other evolutions, which need to be easy and relevant for facility managers, building owners, building occupants (from hotel guests seeking comfort to companies with smart offices and smart workplaces seeking efficiency), and other stakeholders, are on the rise. It is changing building management where, quoting building management systems expert Martin Feder on building management in the age of IP and IoT, IoT makes building management become more central with the BMS as a digital hub going beyond its traditional boundaries. As said on that facility management page also in other areas of facility management similar evolutions are taking place whereby research firm Verdantix started speaking about ‘facility optimization software’ solutions and ‘facility optimization management’. Bringing the words of Verdantix’ Rodolphe d’Arjuzon back in mind, “Facility optimization management is a philosophy that will mean different things to each decision maker in the real estate value chain. Some will look to lower costs across energy, maintenance and building automation and controls, while others will focus on how these factors drive wellbeing at work and productivity, and still others will see the main benefits on equipment uptime, and longer lifecycles”. What is (good) facility optimization software? Verdantix didn’t just describe the ‘new’ category of Facility Optimization Software but also ranked vendors according to the criteria it set out for those ‘innovators’ who are taking the lead in this increasing reality of ‘beyond the silos’ where the comfort and wellbeing of the occupant, building asset optimization and insights into the operational performance or energy aspects of a facility all matter. Early 2018 Verdantix announced the report “Green Quadrant Facility Optimization Software”. 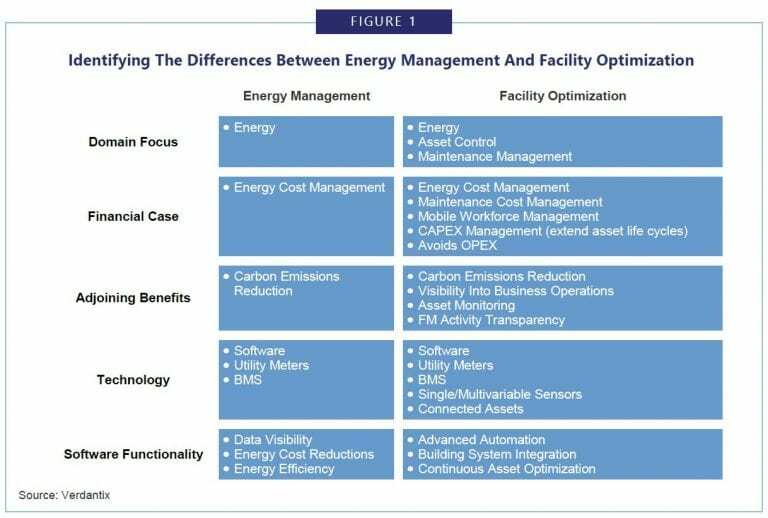 In the press release the company further elaborated on these topics, explored the several aspects and criteria in defining what a good facility optimization software looks like and the benefits of jumping from building energy management to facility optimization. Rodolphe d’Arjuzon summed up a few, on top of the fact that the move from energy management, where this ‘new’ breed of software seems to come, from enables vendors to have a stronger business case. Quote: “The benefits range from stronger energy management, allowing condition based maintenance to reduce activity requirements, cutting down on duplication of data capture and inspections, operational performance insights, to gaining control over small sites without a BMS”. BMS or no BMS: it’s clear that things move, regardless of how we call the solutions. What matters is indeed that bigger picture beyond silos. And of course IoT plays a role in it. Not to get the data of course but to get the data and actually turn them into all those goals you might seek within this broader philosophy: from wellbeing of occupants to improved maintenance management. Simply put: a platform needs to be able to make sense of all that data as in so many other industries and areas and there is indeed a deluge of data, in the age of IoT, increasingly of building data too as he emphasizes. And the next step is of course to move from ‘sense’ to value, purpose (and achievement of it) and smart decisions, taking into account stakeholders and priorities. Smart decisions for smart goals as in smart buildings, not coincidently mentioned by d’Arjuzon since the benefits he sums up are at the heart of the smart building agenda. There is more in the press release (among others, the key role of ecosystems) and there is of course more in the report which we didn’t see but you of course can buy it. What we did see was a series of press release and blogs from vendors who are listed in the Verdantix Green Quadrant Facility Optimization Software report. 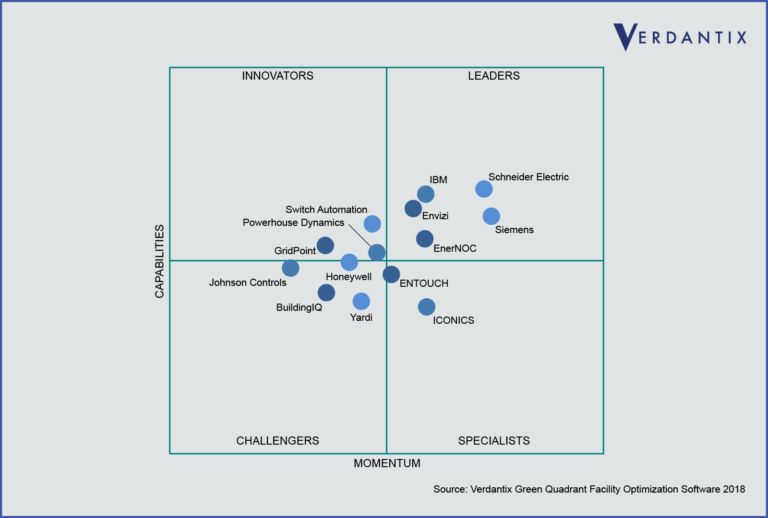 Schneider Electric, which just completed the merger of its industrial software business with AVEVA, has a blog post showing it’s in the upper-right quadrant of the Verdantix Green Quadrant Facility Optimization Software report as leading supplier in facility optimization software as you can see below. The highest scores for utility bill management and energy procurement and risk management capabilities. A strong ability to capture facility performance data, both from energy meters and from systems and devices which rank high on its roadmap such as sensors, HVAC and lighting systems, equipment and external sources such as weather data. High scores for energy monitoring and targeting capabilities, with a special mention of the ability to identify energy efficiency opportunities. Schneider Electric says it has been named as a vendor that should be shortlisted by firms with complex operations that seek to future-proof their building system investments. As you can see Siemens and IBM rank as leaders too but, as far as we can tell, there hasn’t been any announcement about it nor about the reasons yet. Best-in-class energy efficiency identification modules, demand response and utility bill management capabilities. Strength in energy procurement and risk management. Named as an ideal partner for firms managing a diverse range of complex energy strategies. Strengths in facility data capture and management, asset fault detection and enterprise reporting with specifically multiple perfect scores of 3.0/3.0 each for HVAC and lighting system data capture, external reporting and executive dashboard functionality. Named as one to be shortlisted by CRE portfolio managers seeking increased transparency and control over the energy and operational performance of facilities within their portfolios. GridPoint captured the changes in the Green Quadrant facility optimization software report well when stating in its press release that “while the Green Quadrant report previously focused on energy management capabilities, this year’s report encompasses the migration of industry trends towards facility optimization enhancements, including facility asset management, maintenance management, and building automation”. The granular data capture capabilities of its IoT-based smart building solution. Submetering is used to capture real-time data at the asset-level for equipment such as HVAC units, lights, and refrigerators as well as for environmental factors like humidity, daylight, and temperature to create the most accurate picture of energy usage within a building. A high score for its latest mobile application which includes simple dashboards to view the data in, tools for remote troubleshooting, as well as HVAC and lighting control. Named as to be on the short list for any company looking for energy and facility optimization of small and medium sized buildings. If we get more of those press releases or announcements we’ll add them but it gives you a good idea of the various parameters taken into account and the diversity. And if it doesn’t there is still the image below from that Schneider Electric EcoXpert blog. Takeaway: facility management, energy management, building management and whatnot-related-with-facilities-management is changing. And the silos, if they haven’t yet, will come down. When they do some vendors are more prepared than others. Top image: Shutterstock – Copyright: Photon photo – All other images are the property of their respective mentioned owners.